Full sun. In less than full sun, tulip blossoms will twist toward the strongest directional light. Excellent. Most tulips are hardy to -35F (-37C); cold tolerance varies with species. Daylily, Catnip, Bells of Ireland and Salvia. Tulips bloom at the same time as dogwoods and other spring-flowering trees in most climates. Perennial candytuft makes an ideal companion plant. Planting tulips behind daylilies or other summer-blooming perennials hides the fading foliage from view. Set out dormant bulbs from late summer to early winter. 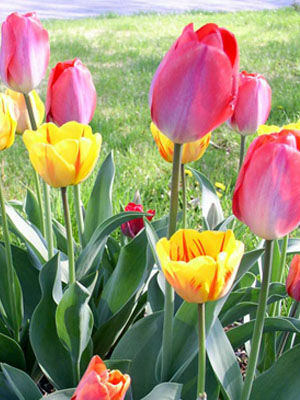 Allow 4in (10cm) between bulbs of miniature tulips, and 6in (15cm) between taller varieties. Cover the bulbs to four times their depth with loose soil. Tulips will return for several years where winters are cold, but may rot when grown in warm, moist climates. Colors choices are endless, from white to almost black. Clear primary colors create a festive effect in a mixed planting. Cut tulips to use as cut flowers just as the buds open. As the flowers fade in the garden, trim them off with scissors or pruning shears. Tulips are often eaten by deer and squirrels. Hot pepper sprays help to deter these nibblers.